This is the story of Mia Bella, the gray kitten we last encountered in a high-kill animal shelter in rural Kentucky. Afflicted with feline herpes and an ulcerated eye, she was not exactly prime adoption material. That, unfortunately, virtually assured that she would be put down within weeks. It had been a good year personally and professionally for Margie and me and we decided to step up our charitable giving. Having already adopted three rescue cats, we chose to contribute to rescue organizations that we felt were doing admirable work. So Margie and I dressed casually and visited one rescue organization after another to see the cats available for adoption. What the rescue coordinators didn't know is that we had checkbook in hand and were there as much to see the people and facilities as see the animals. Eventually, we figured, if we went to enough rescue groups, we'd find the right addition to our family. But our real goal was to help fund wonderful people and organizations. It was an inspiring experience. We heard stories of heroic efforts to save injured animals, abandoned pets, and feral cats. But one story really stood out: the rescue coordinator had arranged for a truck to travel all the way from Connecticut to rural Kentucky to pick up a large group of animals that were scheduled to be put down. How do you not contribute to *that* cause?? So when Margie and I visited the Petco in Port Chester, NY, they were just unloading crate after crate and placing them in the adoption area of the store. Somehow, some way, the group was going to find a home for these transplanted critters! Most of the cats were frightened and shaken from the long ride. They hid in their cages and had to be coaxed to interact. One gray kitten, however, was just the opposite. She pawed at her door and pawed and pawed. She wanted out in the worst way. Margie and I have a preference for colorful cats like the blind calico that I wrote about years ago. (Mali is doing wonderfully, thank you!) But the gray kitten was not to be ignored, so I opened her cage. Immediately she bounded out and I picked her up. She planted herself on my shoulder and purred and purred and purred. Not just a sound coming from her throat, but a vibration running through her entire body. Five minutes elapsed, ten minutes, fifteen minutes. She would not leave my shoulder and she never once stopped purring. Finally I put her back in the cage so I could interact with the other animals. Nothing doing. The gray kitten doubled down on pawing at her cage door until I opened it back up. Then it was back on my shoulder and purring non-stop. A woman at the adoption event watched all this and remarked, "She's chosen you." There it was. It was like so many opportunities in life: you don't find them; you stay open minded and open to experience and they find you. 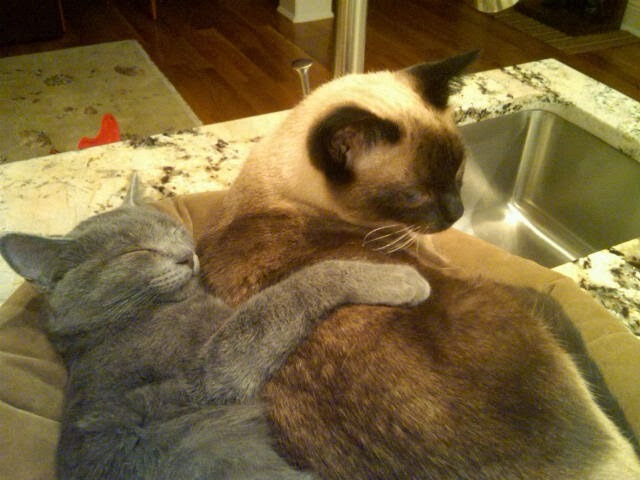 We named her Mia Bella and she fast became best buds with our Siamese beauty, Naomi (see above). Mia sleeps in the crook of my leg every night and, yes, purrs nonstop when I pick her up. I was so inspired by her determination to get out of the cage and her ability to connect with people after going through so much that I posted her story to the employees of our hedge fund. The lesson I emphasized was that when you put yourself out there with everything you've got, great things can happen. It was Mia's insistent pawing at her door and unwillingness to leave my shoulder that brought us together. It was Margie and my willingness to go from one organization to another and extend ourselves that brought us to Mia. Over the years of writing TraderFeed I've shared ideas about markets and psychology over thousands of posts covering many years. My experience has been if you share and share and share and stay visible to the world, eventually the right people will find you. You won't create the next opportunity; it will choose you. So, dear reader, there are times you'll be down, you'll be drawing down, you'll give back all your gains, and you will question what you're doing. It will feel like death row in rural Kentucky and every ounce of you will want to curl up in your cage and escape from the world. That's when you have to put it all out there. You paw and paw and paw at your cage and summon every bit of feeling you've got--not just in your throat, but through your whole being. Because that's what will make the right person open the door to your cage and opportunity find you. It's great to be back; thanks for the very warm welcome.